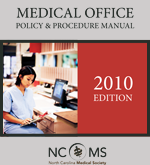 This publication, produced in 2010, is helpful in operating a medical practice efficiently. It can serve as a training and orientation guide for new employees, an ongoing reference for staff, and as a risk management tool that lowers liability exposure in the office. Cost: $90 + tax. Interested in ordering the manual online? Just fill out the information below, submit your payment, and you'll be sent an email with the link to download the manual. The file is in Word format; should you need a different file type, please contact Kristen Shipherd at news@ncmedsoc.org. Please note: After you click on the submit button below, there may be a lag of several seconds as the system processes your payment. Do not click on the submit button more than once; a confirmation message should appear shortly.